Transform Any Outfit Into A Halloween Sensation With The Vampire Bat Wings ! Looks Great Worn With A Costume Or On Its Own. Ideal For Halloween Parties And Trick Or Treating. 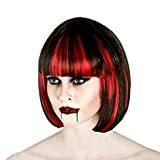 Ladies Alluring Vampire Black and Red Wig. One Size fits most. Perfect for that finishing touch for Halloween or Vampire themed Parties. Do not use heated appliances and brush for desired look!! Add the perfect finishing touch to your fancy dress costume with this fantastic wig. 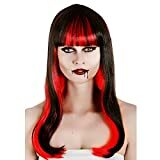 This great wig has short black hair with red streaks running through. 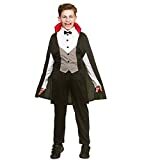 Dress up as a Bloodlust vampire this Halloween and scare all your friends!